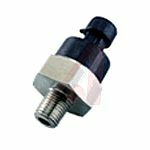 Pressure sensors are used for measuring the force from gases or fluids. Sense the pressure and provide a signal on how much force is being generated. Both digital and analogue versions are available to suit their corresponding application. Waterproof pressure sensors are also available for situations which require a reliable reading within harsh environments. Various workplaces require the use of these, such as automotive Centres (Used to measure air pressure in tyres) and hospitals (used to measure gauge or differential pressures. Measurement of these pressures can then be used to calculate volumetric flow rates).